Quackenbush, William G.. "Barkerville". The Canadian Encyclopedia, 12 August 2016, Historica Canada. https://www.thecanadianencyclopedia.ca/en/article/barkerville. Accessed 20 April 2019. Barkerville is a preserved and dynamic gold-rush town in the British Columbia interior. Each summer, its rich history during the Cariboo Gold Rush and subsequent gold mining in the area is demonstrated for visitors from all over the world. Barkerville is a preserved and dynamic gold-rush town in the British Columbia interior. Each summer, its rich history during the Cariboo Gold Rush and subsequent gold mining in the area is demonstrated for visitors from all over the world. The historic town's 100 original and 21 reconstructed buildings, and large collection of artifacts and documents help trace the evolution of the community and the Cariboo region from the initial gold rush, focusing on placer mining through the continuing exploration for gold in lode and placer deposits. Barkerville was declared a national historic site in 1923 in recognition of the role it played in the development of British Columbia and Canada. 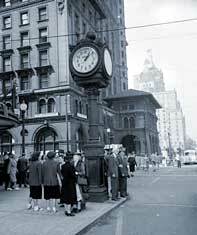 To mark the province's centennial, British Columbia established it as a provincial heritage site in 1958. It is now the premier historic site of Western Canada. In 1863 the gold rush town of Barkerville, BC, had a population of 10 000 (courtesy PABC). Cornish sailor Billy Barker made one of his richest strikes in the Cariboo Gold Rush (courtesy PABC/HP-2428). The Fraser River Gold Rush "excitement" in 1858 drew thousands up the British Columbia river systems in search of the "mother lode." The frenzy spread north to Keithley Creek, Quesnelle Forks and, by 1861, to Richfield on Williams Creek. In 1862, William "Billy" Barker registered a claim downstream from Richfield, from which $650 000 (at $16 to $21 a troy ounce) in gold was recovered up to 1895. 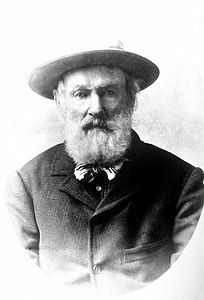 Barker's discovery ultimately sparked the recovery of more than 5 million ounces of gold from the Cariboo goldfields. The Cariboo Waggon Road (see Cariboo Road), completed in 1865, was the conduit by which fortune seekers and freight reached their destinations and opened up the interior of British Columbia. The boomtown of Barkerville sprang up around the Barker claim. It was a jumble of log and false-fronted shanties perched on stilts along a narrow, muddy street, with businesses of every description providing for the needs of miners and profiting from their earnings. Hotels, restaurants, stores, dance halls, saloons, billiard rooms, bowling alleys and gambling houses dotted Williams Creek. Church, theatre and library groups and others such as the Cambrian Hall, Chee Kung Tong (its building was designated a national historic site in 2008), Mechanics Institute, and Williams Creek Fire Brigade were formed to meet the needs of residents. Barkerville burned to the ground on 16 Sept 1868, and was quickly rebuilt in a more orderly fashion and with a wider street. People from all over the world converged on the creek. The initial flood of miners, mainly from California, was balanced by the presence of the British constabulary and justice system and people from eastern Canada. Chinese from Guangdong, China found their way to the goldfields and by the 1880s constituted half of the area's population of 5000. First Nations people (eg, Tsimshian, Haida, Lillooet Interior Salish and Carrier) worked in the region. 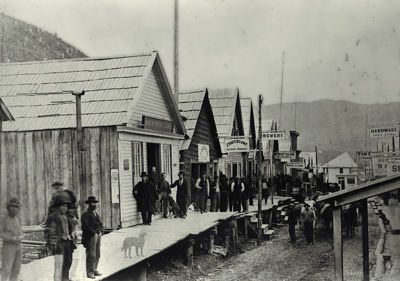 Blacks seeking freedom and a new life, and people from Mexico, Australia and Europe also travelled to Barkerville, making it a cosmopolitan town throughout its history. After the initial rush, mostly placer in nature, fluctuations in mining activities affected Barkerville's population levels. A lack of capital and technical difficulties dashed a lode-mining gold rush in the 1870s. The 1890s saw new activity associated with the large hydraulic mining operations but this activity ebbed during World War I. Renewed quests for placer deposits in the late 1920s were eclipsed by lode mining in the 1930s, when the local population (including Barkerville, Wells and Stanley) reached its zenith of 5800 people. Mining gold in Canada waned as a result of World War II, with a subsequent drop in the local population that continued well into the 1990s when it levelled out to around 250. The last full-time resident of Barkerville died in 1979 and today year-round staff are active in the preservation, development and presentation of this major historical site. Both placer and lode mining continues to this day in the region and Barkerville remains as a testament to both the past and the future. Art Downs, Wagon Road North (1960); Gordon R. Elliott, Barkerville, Quesnel and the Cariboo Gold Rush (1978); Marie Elliott, Gold and Grand Dreams: Cariboo East in the Early Years (2000); W. Howard Harris, Ten Golden Years: Barkerville-Wells, 1932-1942 (1984); W.M. Hong, And So... That's How It Happened: Recollections of Stanley-Barkerville, 1900-1975 (1978); Anne Laing, The Traveller's Site Guide to Barkerville Historic Town (2009); Faith Moosang, First Son: Portraits by C.D. Hoy (1999); Branwen Patenaude, Trails to Gold, Volume 1 (1995) and Trails to Gold Volume 2: Roadhouses of the Cariboo (1996); Mark S. Wade, The Overlanders of '62 (1981); Richard Thomas Wright, Barkerville (1993). BarkervilleThis website is dedicated to the gold rush town of Barkerville, BC. Features information about the local attractions and stage shows that reenact the colourful history of the region.